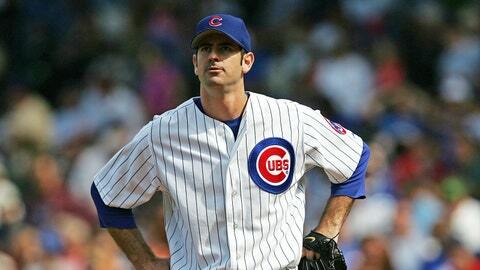 The promise of Mark Prior's early career gave way to frustration. It seems like Mark Prior has been trying to make a comeback for the better part of a decade. And the phenom-turned-injury-stricken pitcher is finally calling it quits. Minnesota Twins beat writer for the St. Paul Pioneer Press Mark Berardino put this out on Twitter Monday night from Lake Buena Vista, Fla., where the Winter Meetings are taking place. Just ran into Mark Prior in the lobby. He is officially retired after shoulder blew out again w/reds triple a. Could join #Padres FO. It seems like just yesterday Prior was mowing down hitters, going 18-6 with a 2.43 ERA, and the Cubs were one game shy of the World Series. But 2003 was a long time ago, and Prior hasn’t pitched in the majors since 2006. Injuries and setbacks have finally taken their toll. Comeback attempts with the Rangers, Yankees, Red Sox and Reds fell short of getting Prior back to the majors. He finishes his career with a 42-29 record and a 3.51 ERA in 106 starts.